Tina's Crop Shop: SIP #75 - Color Challenge! 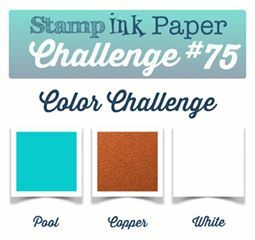 This week over at Stamp, Ink, Paper we have a color challenge! I hope you'll head over and check it out! 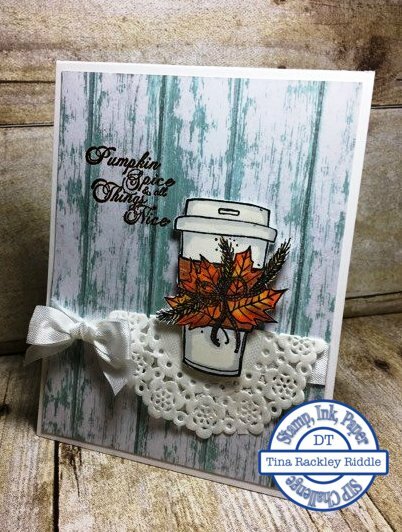 It a great idea to take a little break from your festivities to make a card! (I'm sure I'll do some of that too!) Ok, so the colors are Pool, Copper, and White.. nice combo, right?? I hope you don't mind one more fall card.. I couldn't help it! You see I just had to have the awesome Pumpkin Spice Stamp Set from Unity! It was a stamp of the week a few weeks ago and I thought that since I wasn't a stamp of the week member that I couldn't order it.. well I was incorrect. My friend, Ginger, told me she thought I could and she was right! I was so super duper excited!!! You see I am one of the crazies that just HAS to have a Pumpkin Spice Latte from Starbucks the moment I see the sign saying PSL's are back! So how could I possibly resist this awesome stamp???? I received the stamp set a few days ago and couldn't possibly just put it up until next fall.. it was calling my name! lol I stamped the image with Memento Black Ink onto Whipped Cream FSJ Cardstock that I friend Eva sent me to try out. I used Copics to color it in and then fussy cut it. I used a 11" x 4 1/4" Heavy Base Weight White Cardstock as my base and scored it at 5 1/2". I added a piece of DCWV Winter in the Woods Cardstock that was cut 5 1/4" x 4" and ran a piece of White Seam Binding around it before adhering it to the cardbase. I folded one of my White Doodlebug Mini Doilies and glued it over the seam binding on the right side of the card. I used a Unity Stamp Co. bow maker to tie my little seam binding bow that I glued to the left side. For the life of me I can't seem to make a bow without this little thing! I used Versamark Ink to stamp the sentiment in the upper left side and used some SU Copper Embossing Powder to emboss my sentiment. I used Foam Tape to Adhere The Fussy Cut image onto the front and called it a day! I hope you love it as much as I do! Sometimes the simplest cards turn out to be my favorites! So the background paper is winter in the woods? I am so loving the bar siding with the blue milk paint look! Yes it is! I love that blue milk paint look too! I bought that pack on clearance last year at Joann's on line. I wish I had purchased more of it!